A general trend in this part of the southland has been the gentrification of community theaters. Once the purview of those whose skills might be questionable but found the theater a kind of social club, most have now developed some of the polish, and attracted some of the performers one normally expects of the more professionally based small theaters in downtown L.A.
A case in point might be Sierra Madre Playhouse. Originally catering to its own community, as safe, local and filled with their neighbors, it has morphed over the past year or two into a venue where one can often see – still for a most economical price – quality productions with tight direction and often startlingly good production values. Their current production of the classic Ben Hecht/Charles MacArthur send-up of theatrical types, “Twentieth Century” is case in point. The show is entirely set on a famed luxury train, The 20th Century, which made its way between Chicago and New York City. On it is famed, but broke, New York theatrical director Oscar Jaffe. His minions have managed to wangle him a compartment next to his former love, actress Lily Garland. He hopes to scoop her up with a contract which will – in part due to her Hollywood fame – ensure the funding for both a new production and for the settling of significant debts. Starting up the romance again wouldn’t hurt either. In the middle of this, his staff encounter a rather dotty heiress who will fund his production, as long as it is based on the Bible. Arthur Hanket has a fabulous time chewing the scenery as the over-the-top Jaffe. He plays this farcical craziness completely straight – absolutely essential if the comedy is to work – and yet with the kind of extraordinary energy this crazed artist requires. Stephaine Erb’s equally hyperdramatic Lily matches Hanket’s portrayal in style and overwrought drama. As the weird little woman who may be their backer, Beth Leckbee manages to be gentle and crazed all at once. Balanced against these are the comparatively normal, albeit playwriting doctor (Barry Saltzman) just trying to work out a rendezvous with his frustrated, practical mistress (Dorothy Brooks). Also oozing far greater practicality than their boss are Kimberly Lewis and Alan Brooks as Jaffe’s long-suffering staff. Matt Iseman manages a dim solidity as Lily’s vacantly manly boyfriend, while Grant Baciocco, Matt Bolte, Jill Maglione and little Zoe Hanket play various passengers, competitors and train personnel. Director Michael Lorre has a feel for the farcical nature of the piece and reins in the wilder characters enough to keep the pace rolling. Still, one of the stars of this piece has to be Adam Smith’s remarkable set. If you had told me that an entire train car would have fit on the SMP stage, I’d have laughed. More than that, it is impressively period in style and exudes the class of this luxurious transportation. In short, Sierra Madre Playhouse’s “20th Century” is frivolous, fun, well performed and a pleasure to watch. At the end of a long week, sometimes that’s the best thing: a well-written presentation which will make you laugh, leave you feeling refreshed, yet not tax your brain overmuch. At this price, it’s guaranteed to please. There are few classic films more associated with the holiday period than “It’s a Wonderful Life.” This is the good news and the bad news for any theater trying to field an adaptation, particularly on one of the area’s small stages. Everyone has the film memorized, and any break from the characterizations can be touchy. Finding the right people to play the right parts the right way can be a major challenge. Fortunately, Sierra Madre Playhouse has found a solid crew of performers who keep to the general timbre of the movie, while handling James W. Rodgers’ adaptation of Frank Capra’s original with a comparatively natural sense. Director Christina Harris has a feel for the material, and respect for it. Indeed, the only thing which irritates is the constant and somewhat slow moving set changes in this episodic tale. Scott Harris has captured just enough of the lilt of Jimmy Stewart so that, though they bare little resemblance, the tone remains recognizable. In the process he gives George, the small town loan company operator, an undercurrent of offhand warmth which knits the show together. Likewise, Karl Maschek gives the angel, Clarence, a wry tone which carries his gentle humor, creating a character reminiscent of rather than a copy of what one remembers. It’s a delightful performance. The same shows up throughout. Jack Kandel makes an enthusiastic villain as the evil Mr. Potter. Nancy Young has just enough of Donna Reed about her to make Mary warm and nurturing. Chuck Lacey dodders neatly as Uncle Billy, and Alison Janes walks the fine line between flirt and fallen woman as Violet. Gerry Orz as Tommy, Sophia Davis (alternating with Meg Momsen) as Janie, and especially Charlotte Hardy (alternating with Jessie Ellico Franks) as Zuzu make lovely work of the Bailey children. Lois Tedrow pulls together clothes which are general approximations of 1940 fare. Don Bergmann’s set uses the space remarkably well, awkward set changes notwithstanding. It even has a bridge for George to contemplate jumping off of – a remarkable feat on the small SMP stage. Put all of this together and you have a sweet and sentimental story about sacrifice and appreciation which stands up well. Indeed, there were few dry eyes in the house as George is toasted “the richest man in town.” Nice way to spend a couple of holiday season hours. Please patronize this show and this theater. Putting on shows is expensive, and community theaters always suffer from a kick in the budget. SMP lost a week of its run to the windstorm and power outages. Perhaps this time part of the holiday spirit is giving a break to this venerable little stage. To tell you the truth, the best production of Dickens’ “A Christmas Carol” I ever saw involved Patrick Stewart, a chair, a table and a book from which he read. The story itself proves so engrossing it is hard to find a reason to over-embellish it, even to draw crowds into a theater at holiday time. With its quick lesson on the need for compassion, the ugliness of greed and the concept that happiness is less about money than human connection, not to mention the description of Marley – one of the scariest ghost appearances in literature – Dickens has supplied everything. This is a central reason why the version of this timeless tale at Covina Center for the Performing Arts proved so irritating. The new adaptation by Frank Minano decides to add to, and change, the Dickens original. The padding is superfluous. Belle, the love of Scrooge’s young life, is followed into older age to show her as a shining example of humanity. We get to watch Marley die and Scrooge chuckle over the body as he signs the death certificate, making Scrooge pathologically cruel rather than Dickens’ myopic skinflint. And, once “reborn,” Scrooge doesn’t supply a huge turkey for his clerk’s family’s feast. After bounding about his room like a madman, he arrives at the Cratchits, hands them the turkey for later, and invites them all to his nephew’s house for a Christmas party and dinner to which he alone has been invited – a clash of Britain’s stratified society and a burden on the same nephew he earlier points out has little money. Minano doesn’t stop there. He also stars as Scrooge, and helps to direct, leaving no one but fellow director Hope Kaufman to rein in his star turn. 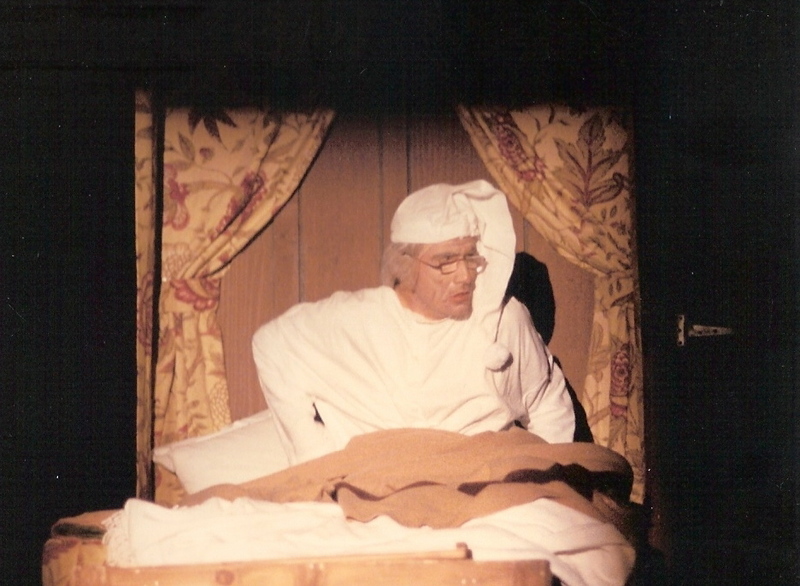 Scrooge’s moments onstage stretch and stretch, and much of the last act is played in the same overemotional key. This is a pity, as from a production standpoint, discounting the lead and the padding of the script, this is a pretty good show. Standouts in the huge cast include Jill Gerber as the Ghost of Christmas Past, Michael Buczynski as the suitably boisterous Ghost of Christmas Present, and Max Herzfeld as a particularly personable Fred. Also worthy of note are Brett Chapin as Bob Cratchit and Gehrig Baes as a satisfyingly unsaccharine Tiny Tim. As always, carolers have been inserted into the drama, but here they are very good carolers and their songs are used to cover set changes. It works. The set, by Mark MacKenzie follows the CCPA tradition of making modular, multi-story creations which keep the set changes short and the segues smooth. The costuming by Linda Vick is fairly accurate, though someone should inform the men in the cast that Victorian gentlemen of Scrooge or Fred’s class almost never took off their coats in public, never at a party, and certainly not if they had – which they didn’t in those days – a vest with no back. So, although this “A Christmas Carol” is fantastically overblown, it still has things to recommend it. Unfortunately, with the carols and the additional material, it is also long, and gets longer if Minano is really on a roll in the second act – a tough thing for the small children in the audience. In the end, my advice to any and all who choose to dramatize this famous short story is this: just tell the story. Really. Dickens knew his characters and his audience. Trust him. 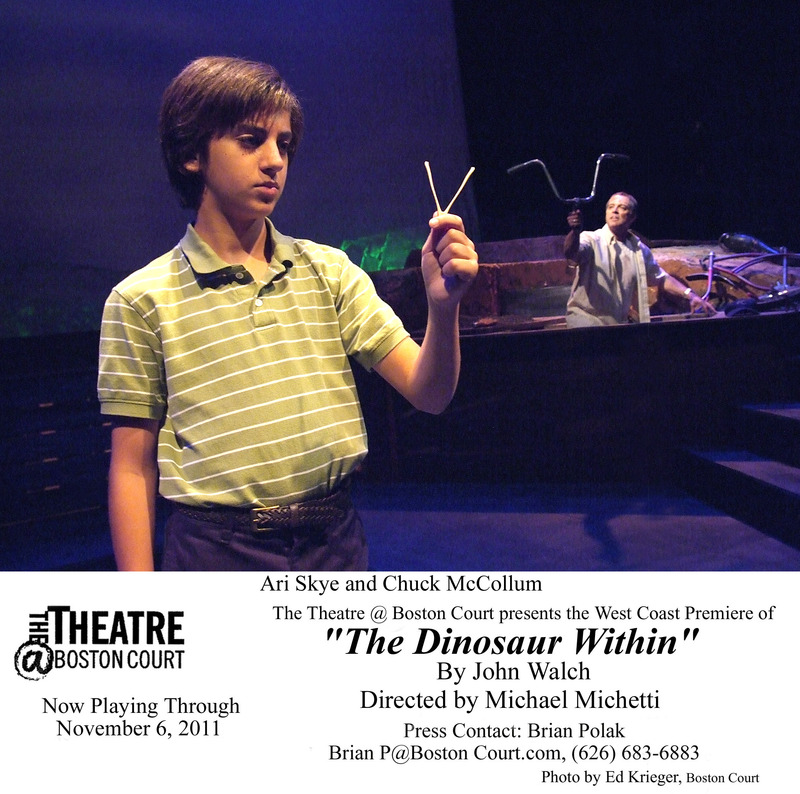 Close to the start of the new play at The Theatre at Boston Court in Pasadena, a young boy comes down to the edge of the stage to explain that he has a dinosaur inside him. This, as a part of discussing the paleontological discoveries regarding the evolution of certain dinosaurs into birds. Indeed, the balance between the extinction of most and the adaptability of a few dinosaurs provides the symbolic underscore to “The Dinosaur Within,” John Walch’s play receiving its premiere at Boston Court. A study of grief and change, it gradually divides its protagonists into those with the ability to adapt and grow, and those destined to fall by the wayside. Still, though these latter may be “dinosaurs,” this does not make them superfluous. Which is not to say that the resulting arguments are wildly original, though the telling certainly is. Beautifully told and extraordinarily well set, the contention appears to be that becoming a “dinosaur,” at least an irreparable dinosaur, is generational. This would, therefore, amount to an extended ode to the adage “you can’t teach an old dog new tricks,” except that the elements of grief these characters contend with prove so compelling. For Worru, the Aboriginal traditionalist desperate to retain the ritual, culture and sense of place of his people (given an underplayed but distinct presence by VJ Kesh), the losing battle with paleantological poachers, modern society and his own son lead to the ongoing grief. For Miss Wells, the faded, fragile former movie star (a restlessly commanding Mimi Cozzens), the ghost of decisions made to save her career from her own heart’s leanings have crippled her ability to connect with anyone else. And Jerry (a very genuine Chuck McCollum) is stuck, unable to move past his young son’s disappearance and probable death. Balanced against these, and moving forward in ways their elders cannot, comes a new generation of characters. These thematically center around Tommy (an articulate and amusing young Ari Skye), the disappeared son pushing his father toward reality. Intertwined are the modernized Aborigine with a passion for classic Hollywood (Nic Few), and the disaffected actress’ daughter searching for an emotional foundation (an edgy Shauna Bloom). The articulation of these journies, aided by a host of officials, family members and ghosts of the past (Rebecca Tilney, Scott Alan Smith and Emily Kosloski) is what proves compelling. As each struggles between the call toward a rueful and static life and the necessary changes of personal progress, one cannot help but empathize with both the difficulty of change and the mourning one goes through for a past one cannot repair. Still, the theme behind “The Dinosaur Within” is hardly an earth-shattering revelation. On the other hand, infused with Aboriginal belief systems, set by director Michael Michetti in Francois-PIerre Couture’s ethereal collection of levels and projections, it celebrates the spiritual even as it moves its more adaptive characters forward into the practical present. This play will not leave you comfortable. Still, the intimacy inherent in dealing with loss, along with this play’s contentions regarding the futility of holding on to traditions, is bound to inspire rich discussion.Sometimes being forced to face one’s own preconceptions is inspiration in itself. Among the trickier, but also potentially more interesting one-person shows are those which involve biography. Creating someone everyone wishes they had met can be immensely satisfying for both actor and audience, and historically illuminating to boot. 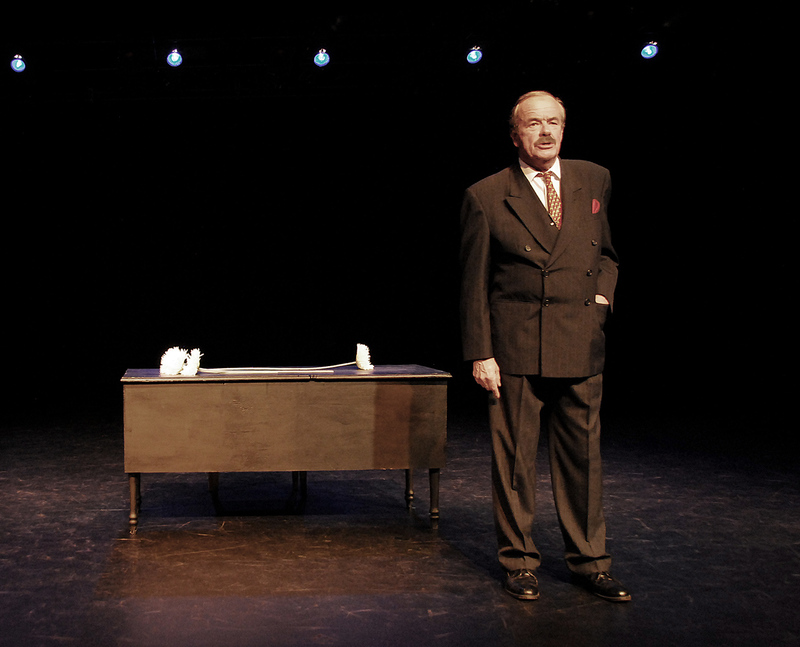 Take, as the prime example, Hal Holbrook’s “Mark Twain Tonight” which utilizes Twain’s own writings and speeches to recreate an evening with the quintessential American author. The trick is having enough to say, saying it as the historical personage would have, and creating enough “business” while in front of people to keep the thing from becoming a costumed lecture. All of this should be taken into account by the creators of the rather self-consciously titled “The Unauthorized Afterlife of Eugene O’Neill,” now at the Carrie Hamilton Theatre upstairs at the Pasadena Playhouse. Playhouse grad Jim Cady is both author and star of this piece, in which an ethereal O’Neill speaks to us of his life from a position similar to Marley’s Ghost of Dickens fame. He is out to crow a bit about how he changed literature, and then speak of the dysfunctional and depressive family from which his creativity was born. A litany of despair, addiction, suicide and neglect fill the evening. If only it were said with the eloquence of O’Neill. Except for segments all but quoted from O’Neill’s own work, the Cady script tends to float into the simplistic and the cliché. For example, a great man of letters would not, more than once, refer to death as a “shuffle off to Buffalo.” At least, he wouldn’t in public. And, with the exception of some eventually symbolic, very large mums, there is nothing on the stage for him to work with, giving him too little to do. Even the set, such as it is, proves defeating. What should be a desk and chair is a desk and box – a box over which the actor trips more than once. This is not to say that the material isn’t interesting. The research into O’Neill’s personal story proves factually accurate, and sometimes quite moving. Still, the end result, under director Brian Hansen, is static. The man stands and talks much of the time. One hates being enervated by such a wrenching tale. It reminds me of the standard poet’s critique: “don’t tell me, show me.” How could we see, through the eyes of this famous man, what it was like to decide not to go to the funeral which followed the suicide of his own brother, or his own son? Don’t tell how stunning it was to discover your own mother shooting morphine. Show what it felt like. Use quotes from the autobiographical “Long Day’s Journey Into Night” if you have to – they reveal what that was like. Still, Cady does look the part, and the information gives an underlay to this incredible writer, whose plays changed the structure of American drama even as they pushed to the fore (as did Miller and Williams, alongside him) the dilemma of the everyman. It’s just good enough, though, that it should by rights be better.